Facebook Chief Technology Officer Mike Schroepfer and Director of Engineering Jocelyn Goldfein spoke at the she++ conference today, making Facebook by far the most represented company at the Stanford conference. Their public remarks and comments shed light on Facebook’s aggressive strategy to recruit talented engineers to join their “deep bench” — the company’s greatest asset, according to Goldfein. Goldfein has been heavily involved with she++, appearing in the documentary and speaking at both conferences. Schroepfer says the company does work with the Anita Borg Institute and Grace Hopper conference as well. For the past few years, Schroepfer and Facebook CEO Mark Zuckerberg have guest lectured once per quarter in Stanford’s introductory CS class; it’s become both a unique aspect of one of Stanford’s most popular classes and a great recruiting event for Facebook. 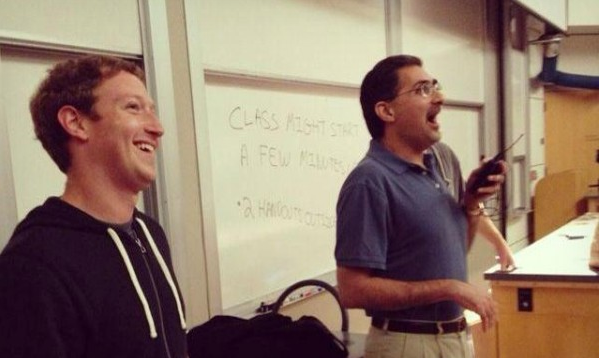 Mark Zuckerberg in CS 106A with Stanford professor Mehran Sahami (Courtesy of Jacob Chen/The Dish Daily). Goldfein and Schroepfer say they then turn their attention to the “pipeline problem” and work to increase the total number of software engineers in the world, namely by increasing the number of women. This summer, the company is experimenting with a program called Facebook University to “reach further up the pipeline.” While traditional Facebook summer interns are college juniors and seniors or graduate students in computer science, the company wants to reach students finishing their freshman year of college; Goldfein says they will teach these students principles of coding, particularly for mobile, and give them a taste of what working at Facebook is like. She says the inaugural Facebook U class for this summer is 30 students, two thirds of whom are female.